Sneak more veggies into your lunch with these addictive collard green wraps! The crisp leaves surround a creamy, bright spiced carrot hummus. In order to make collard green wraps exciting, a punchy, flavorful filling is a must. 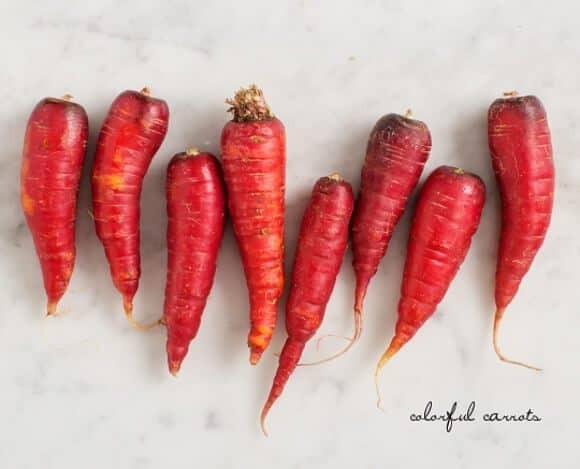 I had these pretty red carrots, which made me think of this Harissa Carrot Hummus recipe I had recently seen from Aida Mollenkamp. I took a few liberties, (mostly because I was too lazy to go look up the actual recipe). Among other things, I pan-roasted my carrots to add a slightly smoky flavor and squeezed in some orange for a nice bright kick. Feel free to play around with the rest of the filling. I added chickpeas, millet, shaved carrots, cabbage, and a big sprinkling of hemp seeds. Wrap it all up like a taco and enjoy for lunch or a light dinner! Want more healthy lunch ideas? 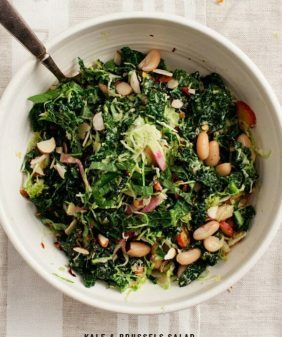 Try this kale salad or this noodle bowl, or check out this post for my favorite lunch-packing tips! For the carrot hummus: Heat coconut oil in a medium skillet, add carrots, garlic cloves, and a pinch of salt. Cook, rotating occasionally, until the outsides begin to char, about 8-10 minutes. Remove the garlic if it starts to burn. Add the harissa seasoning and let the carrots cook for just a minute longer. Remove from pan and let cool slightly. Peel the garlic. Chop carrots into 1-inch pieces (it's ok if they're a little raw in the middle). Add the carrots, garlic, chickpeas, lemon juice and orange juice to your high speed blender or food processor. Puree, drizzling in the olive oil as you blend. (Note, I used a Vitamix to get mine really smooth. Yours might be a chunkier texture if you use a food processor). Taste and adjust seasonings to your liking. Chill until ready to use. For the wraps: Trim off the coarse part of the stem. (Note: my leaves here were on the small side, if yours are bigger, slice more of the tough stem off). Optional step: blanch the leaves in boiling water for just a second, then transfer to ice water. Let them dry before assembling. (Recommended if your leaves are large and coarse). 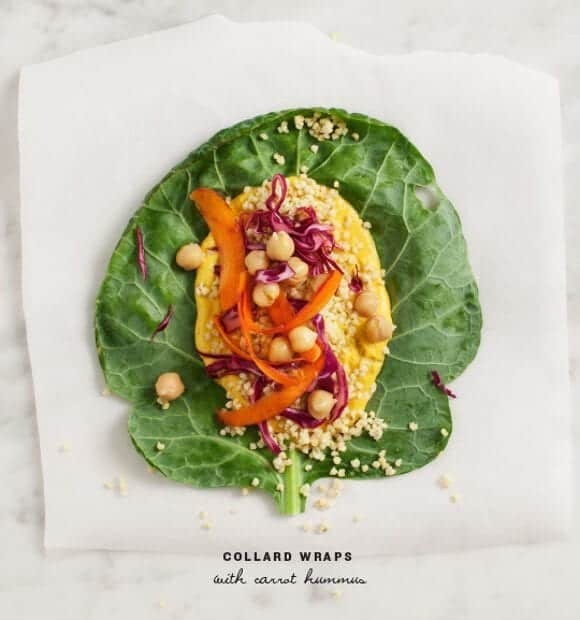 Assemble each wrap with a scoop of the carrot hummus, the millet, chickpeas, carrot ribbons, cabbage, and hemp seeds. Eat like a taco! If your leaves are larger, you may want to wrap it up and tuck the edges like a burrito. If you don't have harissa, sub in other spices such as cumin, coriander, chile flakes and/or smoked paprika. For a quick red cabbage slaw: thinly slice red cabbage, splash with sherry vinegar and a pinch of salt and let sit for at least 15 minutes. This is my favorite sandwich replacement. The leaves are so lovely and fleshy, they really can hold up against just about anything you put in them. I actually love wrapping them around burgers. The flavor is truly complementary and the texture really satisfying. I’ve got to try your recipe – yum! I know, I just love the crunch – I’ll have to try them around my veggie burgers, great suggestion! Love, love, love this! Love the collard green wrap and the carrot hummus!! I know what I’ll be having for lunch today. This is such a fabulous meal!! Loving this! Thanks Eileen! The veggies we have at our farmers markets right now are so fun and colorful! Holla fo’ collards!!! I love collard greens and like you said – they work brilliantly in the place of tortillas. but i could never give up my bread. ever. But these look ridick – just pinned. So pretty! And healthy. Love it, Jeanine! 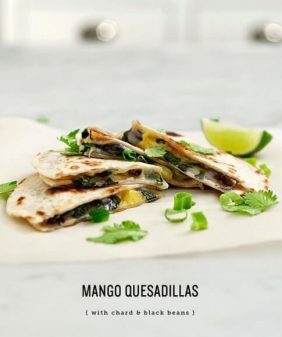 These wraps are beautiful, and I’m sure delicious! Oh my, as I read this post, I’m eating almost the exact same collard wrap except 1) I’ve got regular hummus, 2) my carrots are the regular kind, not your pretty red ones, and 3) there’s quinoa inside rather than millet. Great minds think alike!? One thing’s for sure though – mine is nowhere as pretty as yours! This is a great alternative for someone who doesn’t eat grain. I had to give it up a little over a year ago. In the summer I love a good lettuce wrap, but this is much heartier. Other leafy greens can be a little bitter, but collards are tasty and filling. Thanks for reminding me of this option! Looks delicious! Love this recipe! Especially the addition of orange juice. I can’t wait to make this. I just made my own hummus again for the first time in a really long time, so now I’m excited to start making a bunch of different variations. Hahaha. We just made collard “tacos” last night for dinner! They are one of my favorites. This version sounds fantastic too! Gorgeous! I actually really love collard wraps, so this is totally my thing! Oh and that hummus sound incredible! Love this idea, and red carrots are my favorite, too. Now I just need to go get some harissa. 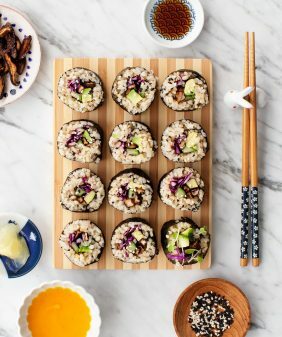 this is so creative and delicious – perfect way to kick off this New Year. These look SO yummy and fresh. They remind me of the collard wraps in The Sprouted Kitchen cookbook. I haven’t tried them yet, but I do have some chard growing in my herb garden, of course home grown doesn’t quite have the size of leaves of the stuff they sell in the store. This carrot hummus would be good on many things though…thanks for sharing! Pinned 🙂 Sounds so healthy and yummy that I have to make it. So pretty! A great way to kick off 2014. What a great combination, sounds delicious! You’re welcome – so sad about the hole-ey kale, glad you enjoyed it with the chard! Happy 2014, Jeanine! I love that my hummus inspired such a delicious-sounding recipe. But, yes, I will *never* be able to give up tortillas permanently so I’m glad we’re on the same page! Just wanted to say the pics alone on this are stunning! Great work. Collards are to behold! wow, this sounds absolutely fantastic! I love this idea! We’ve tried wraps with other leaves before, but many times they fall apart. 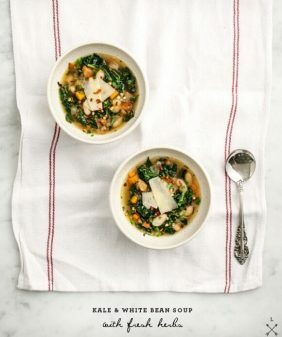 I’ve never thought of trying collards! Looks so bright and beautiful. 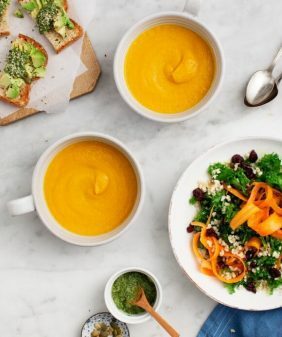 These look lovely – the hubby and are trying to eat more seasonally so this should be perfect for lunch! Time to scour the weekend farmer’s market to see if they have collard leaves – most supermarkets in London don’t carry them whole. I love your use of millet. 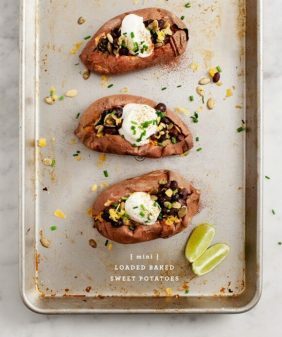 I’m not 100% gluten free, but try to avoid it/branch out as much as I can, I’m definitely going to try this recipe. I don’t have millet very often and would like to incorporate it in some more meals. Thanks for sharing, ps. I love your photos! Hi Lisa, thanks! I’m not gluten free either, I just love millet because it tastes so good! I love this as it makes super healthy food look so cute and pretty! Will definitely be trying it. Thank you for share.I like eat carrot very must.carrot make a healthy. kinds of things, so I am going to tell her. Thanks for the adding some amazing ways to eat more vegetables. You know eating a variety of green vegetables are most important. These wraps are amazing! What a delightful summer dish. Such a healthy meal. Since the collards are thick great for holding the other ingredients together, Thanks for this recipe. I might use it as a healthy appetizer for dinner parties.